Today, we start our dream trip. You’ll be meeting our representative in Delhi at the bus pickup point. We will travel overnight by Bike from Delhi to Pathankot. Once you arrive in Srinagar, get transferred to your hotel or houseboat as per the availability. Enjoy the mesmerizing views of Dal Lake while you are on a Shikara Ride. The rest of the day would be free and spend it wisely. Overnight stay in Hotel JZ Bazaz. After breakfast, leave for Kargil from Srinagar crossing the famous Zoji La, Drass Village (2nd Coldest Inhabitated place in the World). En-route have magnificent views of Kargil war Famous Peaks (Tiger, Tololing) from Vijay war memorial hall site, reach Kargil by evening. Overnight stay at Kargil in Hotel Green Land. After Breakfast leave for Leh. Today you'd have a full day excursion to visit the monastery. After breakfast drive along the Indus to visit the Thiksey monastery and Shey Palace, and visit, Magnetic Point, Gurudwara Pathar Sahib and The Hall of fame on your ride back to Leh. Visit the Leh Bazaar in the evening and witness the Sunset at Shanti Stupa. After breakfast, we would start our ride to Nubra Valley (120 Kms) via Khardungla (Highest accessible Motorable road in the World, 18,380 ft). Rest of the day is free for you to explore Deskit, Hunder Village and enjoy camel safari at the Sand Dunes between Deskit and Hunder Village. Stay overnight in Swiss Cottage Camp K2. Today we will be taking one of the most uncommon routes in Ladakh area via Shyok village which has recently been opened up for the tourists. While riding you will definitely enjoy the scenic views of the mountains. This route is also known for its waterfalls. Overnight stay at Pangong in Himalayan Wooden Cottage. Wake up in the morning to the beautiful Pangong Lake and enjoy a breakfast looking at the lake. Start your drive back and pass through Chang La Pass. Visit the Big Buddha at Thiksey Monastery. Also, visit the Shey Gompa and Palace. Reach Leh and have dinner at the hotel(Hotel Silkway) after checking in. Overnight stay back at Leh in Hotel Silkway. After breakfast, we start our ride towards Sarchu. We would be spending the night in a guest house here. 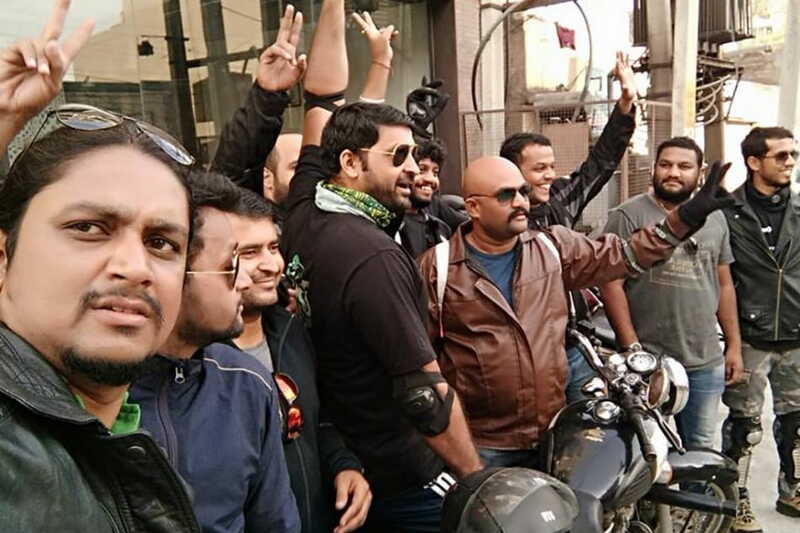 After Breakfast, we start our ride early in the morning toward Manali. This is one of the longest rides of our journey. En-route you will enjoy the beauty of Moore Plains and the Pang landscapes. The route is slightly rough, so this day we shall try and cover the maximum distance with minimum stopovers. We arrive in Manali by the evening, followed by hand over of the bikes and gear. Later, we all celebrate the completion of our epic road journey. Now its time to return to Delhi after a remarkable and memorable road trip. Pick up and drop from/to Delhi. 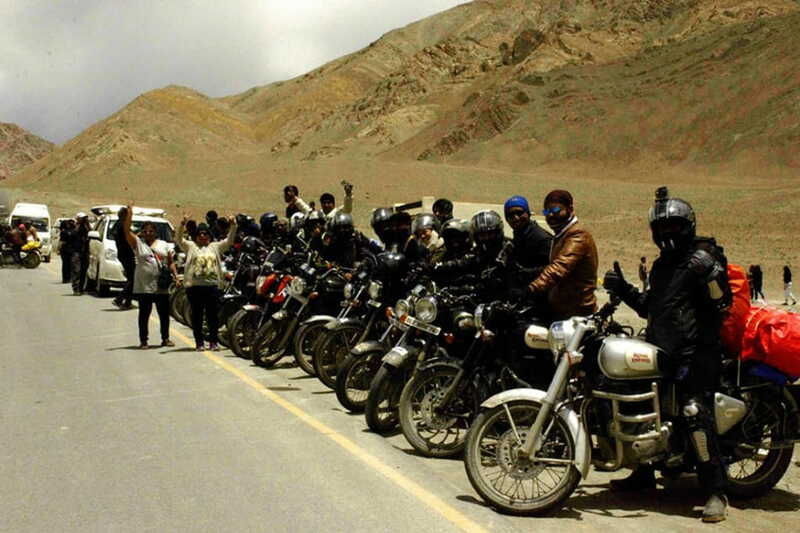 All the necessary charges and permit fees while exploring certain places in and around Ladakh. Meals From Day 1 dinner to Day 11 breakfast (except lunch). The first aid basic kit is available for the riders along with the portable oxygen. Petrol, backup vehicle & mechanics are available at an extra cost. Personal Expenses and also the personal porters to carry luggage. Insurance of any kind for this trip. We do not hold the charge if the belongings of the travellers are damaged. It is at their risk. Anything that is not part of the inclusions list. Backpack with all your necessities to manage and cope with the Ladakh atmosphere. A rain cover because you cannot predict the Spiti Valley or Ladakh's temperature. Snacks like the energy bars and the protein bars which would give you instant energy during the Ladakh trip. Pack your outfits with all the relatable clothing items like wind and waterproof jackets, t-shirts, track pants, thermal inners, riding shoes and fleece jackets. All the necessary winter outfits for the winter treks. Also do not forget to take your extra accessories like sunglasses, caps, gloves, walking stick, torch, and similar other items. You must avoid sports shoes, jeans, and shorts while going to the Himalayan camp. It is always better to stick to the trek pants and the joggers. You need to pay only 25% of the total amount to confirm your booking with us. Rest 75% can be paid as per the booking terms & conditions. The organizers made our journey possible. If it were not them we wouldn’t have made it. The zig zag roads amidst the mountains is too much to handle. I have never been to such a place before so for me it was a completely new experience. But when I reached the topmost point. I sensed a kind of achievement in me. The feeling was just awesome and I was wondering when did I feel the same before. Overall the journey was full of thrill for me. When I wonder how the soldiers of our country manage to stay there and guard the post, it gives me goose bumps. Me and my friends decided to go to Khardungla pass for a road trip. Earlier we had a lot of road trips to Manali etc but travelling here the excitement was of some other level. The view of the snowy mountains and the chilled weather, I could literally feel the transition in the weather from hot to being cold. The entire trip was beautifully organized by the team. Reaching to world’s highest motorable pass is an achievement in my life. I went to this place with my friends. It was pretty affordable. The team had covered so many places and with a value of money. 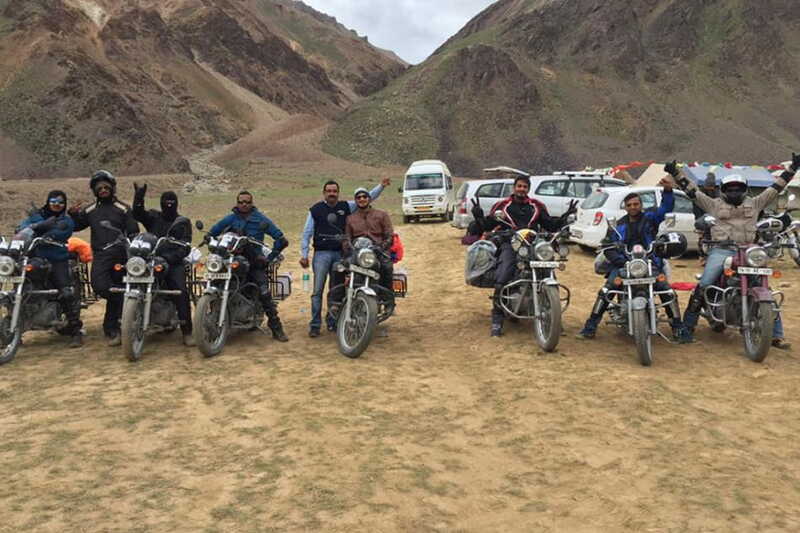 First the riding started in Leh and then from Leh to Khardungla, pangong lake and the local sightseeing. Everything went well. They had trained motor cyclist who were well known about the routes and always carried safety things whenever needed. The beautiful pangong lake is just awesome. The scenic beauty of the Ladakh valleys is something that everybody should view once in lifetime. We had a thrilling experience with very supportive guides who helped us whenever we needed help. I am a motorist. Earlier I have gone to a lot of road trips with my friends. But going to such a place with so much of altitude is a thrill task. And going there was my first time. You will fall in love with this place while going at a height by the motorcycle. But this place is not safe for new riders. The roads are very tough. One has to carry medicines and oxygen cylinders to have precautions in case of danger situations. You need to get a permit from Leh to go to Khardungla pass. Our organizers did a great by taking all the permissions and passes in advance so we didn’t have to put a lot of efforts to take the permit. They were very well organized as when we climbed higher we feel as if there is less oxygen to breathe in. so extra oxygen cylinders need to be carried out in case of emergency. This place is a "must see" place for anyone who visits Leh provided their health condition is good and the weather condition is also good.